The lifetime of a tire can vary a lot depending on a huge number of factors and you should do your best to extend your tire's lifetime as much as possible. On average, a good quality front wheel tire can reach up to 20,000 miles before it needs to be changed, while the tires on the rear wheels can be used for almost double that distance, 40,000 miles. This happens because the front wheels do all the cornering, which creates a lot of friction, resulting in an increase in tire degradation. That is why it's important to maintain a proper tire rotation system so you don't end up with significantly more worn out tires in the front and fresher tires on the rear wheels. Probably the most important factor in maintaining a tire is its pressure. An over-inflated tire will produce a more uneven wear with the middle of the tire getting more worn-out than the exteriors. On the other hand, an under-inflated tire will have an increased contact surface and it will result in a quicker degradation. That's why it's important to check your tire pressure weekly and always fill up the tires up or release some air accordingly (for best results, check the pressure before starting the car as running it can influence the reading). Loading your car with excessive weight is another reason that could contribute to your tires' premature degradation and should be avoided as much as possible. Another factor that influences how quickly your tires will last is your driving style and the speed you're driving at. Driving more aggressively, with a lot of braking and high-speed cornering will reduce your tire's lifespan as those actions create more friction which is not good for the tire. Also, driving at a high speed increases the tires' temperature which in turn further reduced their lifespan. This is why if your daily routine includes a lot of windy roads or roundabouts you can expect your tires to last less than if you would be driving mainly on a motorway. You should also be careful of natural degradation, which happens regardless of other factors and it's caused by natural elements, like extreme temperatures, UV light (sun exposure) and rain. If you live in an area with huge changes in temperature from one season to the other, you should always make sure to use tires appropriate for the season if you don't want them to degrade prematurely. One other factor that can influence how long your tire will last is your suspension and wheel alignment. 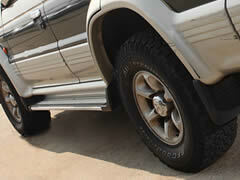 Wheels that aren't aligned correctly will cause the tires to wear out much quicker and uneven. Worn-out shock absorbers can also lead to tire wearing out faster than average and that's why you have to check them regularly and make sure they're in a good condition. As tires wear out you will notice your car's grip going down, especially in wet conditions. It's very important to regularly check (every time you fill-up should be enough) your tires' tread depth to make sure your tires are always safe to use on the road. Checking out your tires' tread depth is very easy with a penny coin. Put the coin upside down in the tread and as long as President Lincoln's head is covered by the tread, they are still in good condition. However, if the tread doesn't cover it you need to change your tires immediately as not doing so can be very dangerous for you.